Now that Carl has returned safely from the Saviors stronghold Rick is more determined than ever to strike back at Negan. 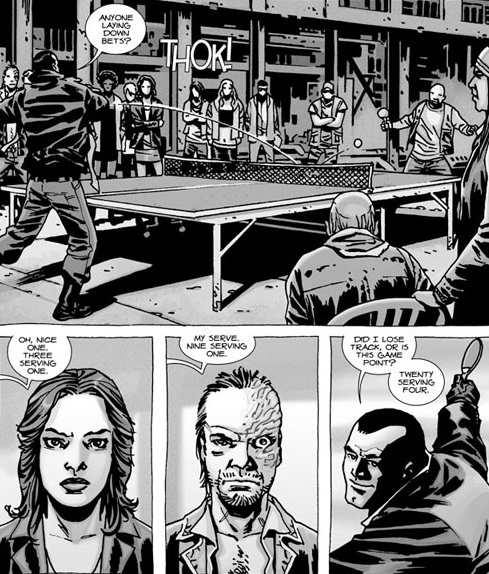 With the information they now possess about the strength of Negan’s forces, Rick and Jesus attempt to forge an alliance with the leader of another group of settlers. While Carl and Michonne deal with a pack of Walkers outside the gates of Alexandria, Rick and Jesus are allowed to enter The Kingdom settlement by the horseback patrols and make their way towards the headquarters inside the school for an audience with King Ezekiel and his pet tiger. The meeting with Ezekiel goes well. Rick is relieved to learn that Ezekiel wants to be rid of Negan and the Saviors as much as he does, and the information Rick provides about Carl’s time inside Negan’s base makes Ezekiel feel confident that the time has come to attack the Saviors. 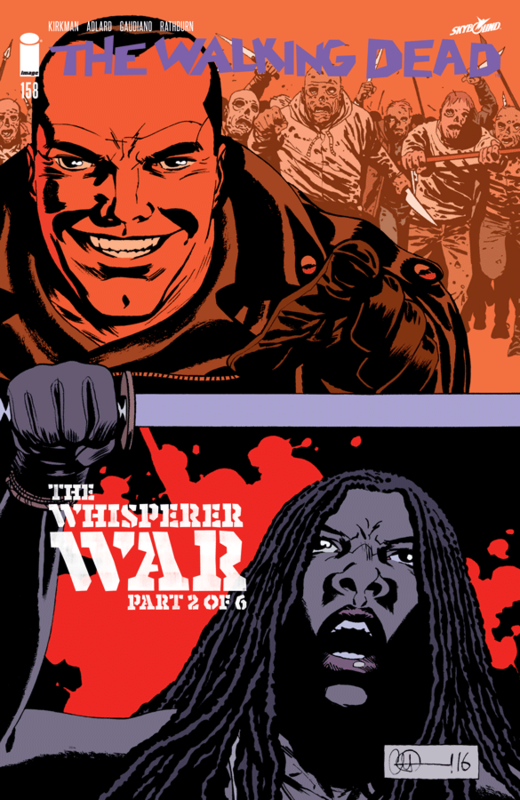 Ezekiel finally agrees to help Rick and the people of Alexandria bring Negan’s reign of terror to an end, while also offering the services of a new ally who has decided to join their fight against the Saviors, one of Negan’s own lieutenants – Dwight. 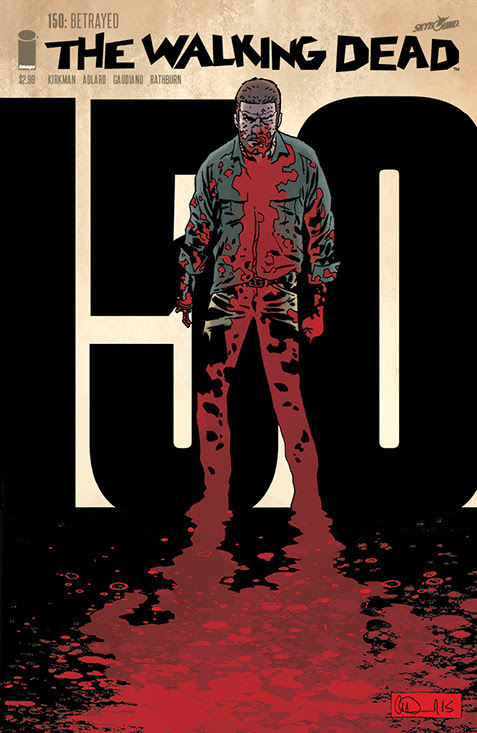 The Walking Dead #108 finally sees Rick beginning to take some decisive action against Negan and the Saviors. We have watched as Rick has been forced to submit to Negan’s demands, handing over precious supplies to ensure the safety of his group, and even being beaten up and humiliated in front of his son, now the time has come to strike back. 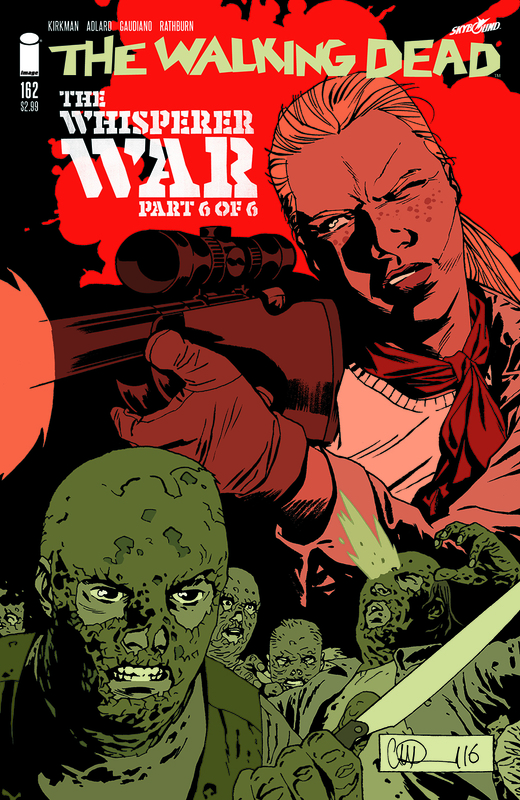 Robert Kirckman has taken Rick Grimes to the edge and back with this incredible new storyline. We have begun to see just how resourceful Rick can be, how he will stop at nothing to protect those closest to him, even if he has to risk alienating people to gain the advantage they need to defeat the Saviors. 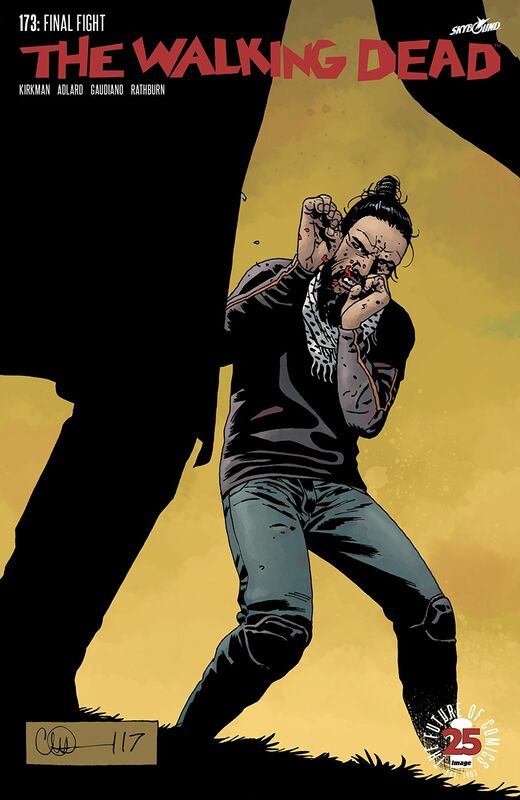 Negan continues to rule over his people through fear and intimidation. Even a simple game of table tennis becomes a lurid double-entendre dripping with threats of violence and the imminent sexual degradation of Dwight’s wife. The Saviors may be the biggest settlement amongst the Hilltop communities but they are not as well trained as Rick’s people or those of the Kingdom. 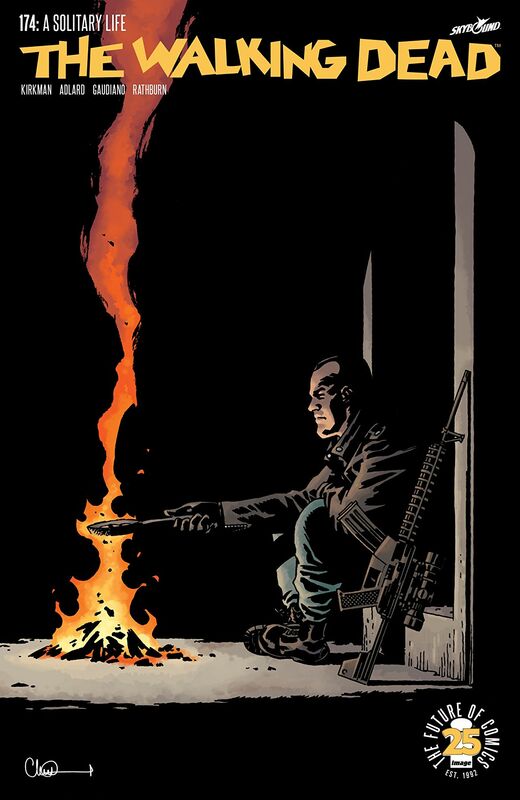 However it would seem that Dwight’s betrayal could well be the key to Negan’s downfall. 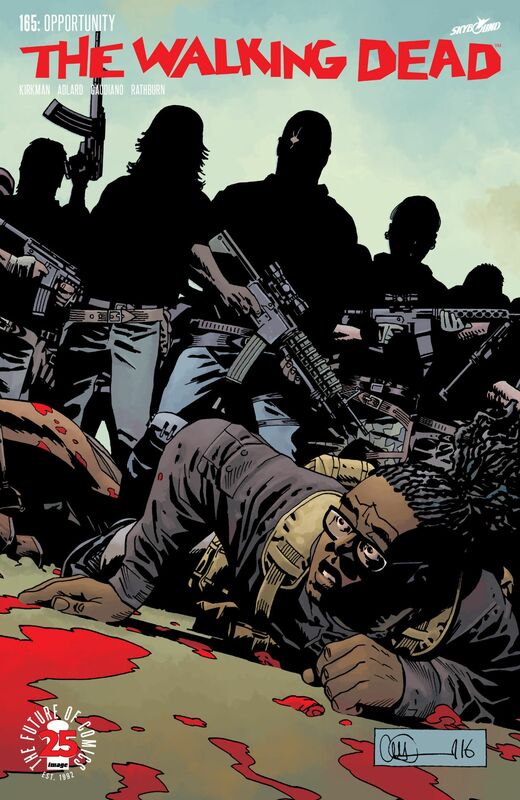 Ezekiel is another fantastic new character, and brings a much needed splash of dark humour to the pages of The Walking Dead. Indeed, Ezekiel has never been a party to Negan’s truce, and crowned himself King of his own Kingdom to keep his people safe. 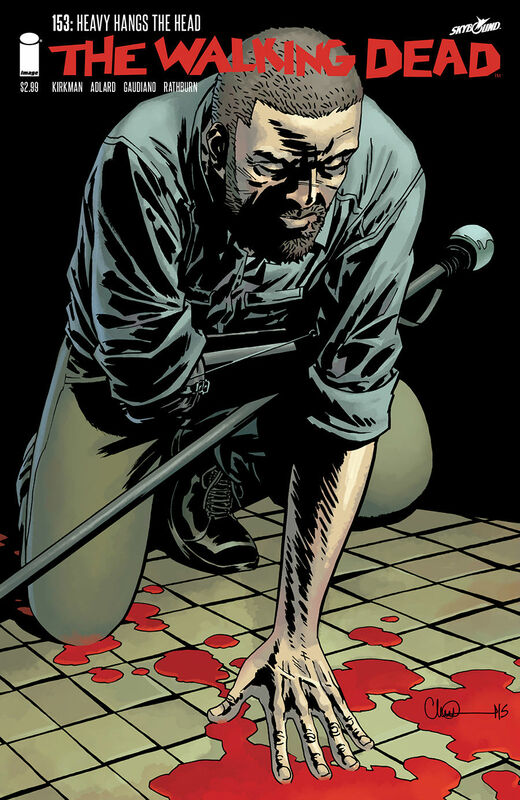 He seems to hold nothing but contempt for Negan and the Saviors, and has often felt exacerbated by the way Negan gained such power on the back of so many lies and heinous acts against his own people. Ezekiel also knows Jesus very well, considering him a true friend, and is grateful that he has brought Rick to meet him. The look on Rick’s face when he sees Ezekiel’s tiger, Shiva, for the first time is priceless. 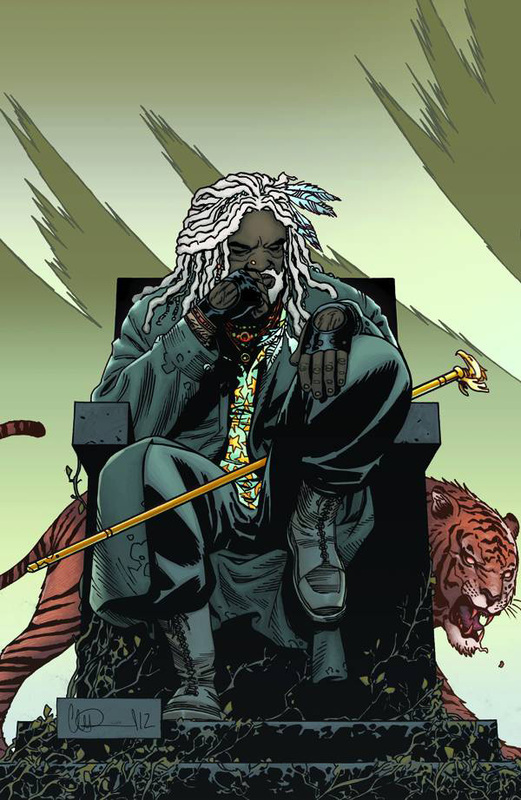 Quite how Ezekiel managed to own a pet tiger remains to be seen, it certainly adds an intriguing dynamic to the character, and he certainly doesn’t have to worry about any Zombies getting too close with Shiva around! 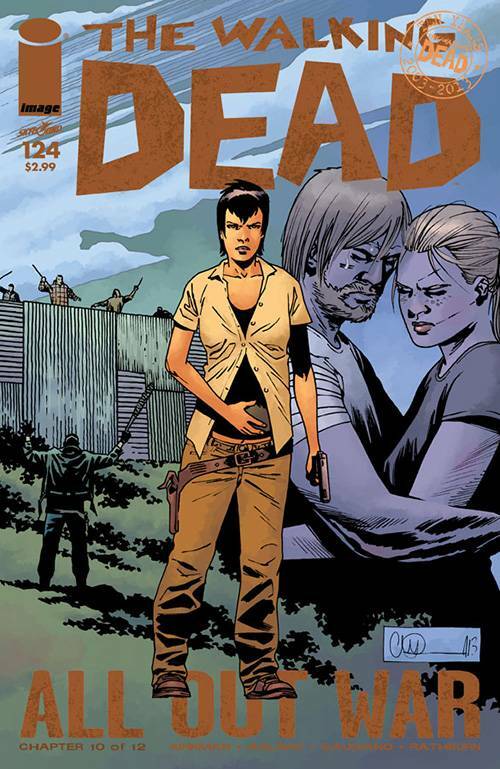 The art by Charlie Adlard in The Walking Dead #108 perfectly illustrates the harsh realities of the Zombie apocalypse, and the scene where Michonne and Carl have to face a horde of Zombies outside the gates of Alexandria really ups the stakes when Cark is caught of guard and nearly overpowered by a Walker. 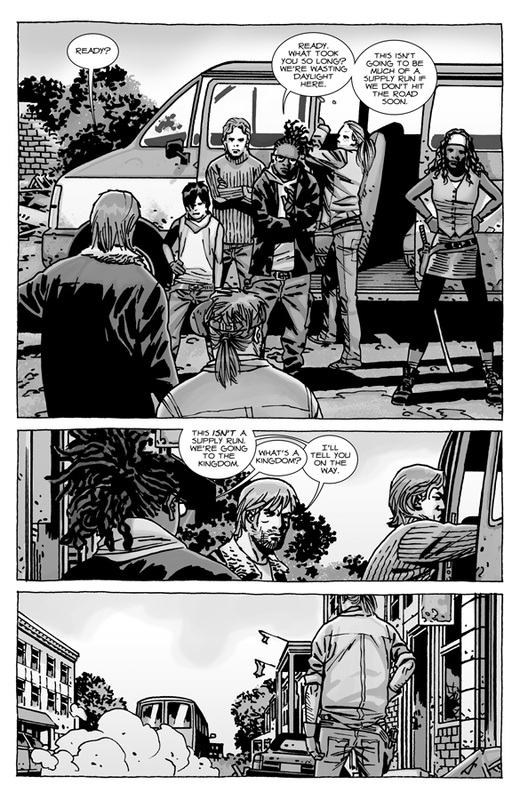 After helping Carl get free, Michonne drags him inside and chastises him for disobeying her direct order to retreat, but when Carl says he feels worthless because he is blind in one eye Michonne is quick to reassure the boy – reminding him how his father coped after he lost his hand; and that Carl will also learn to adapt to his limitations over time. 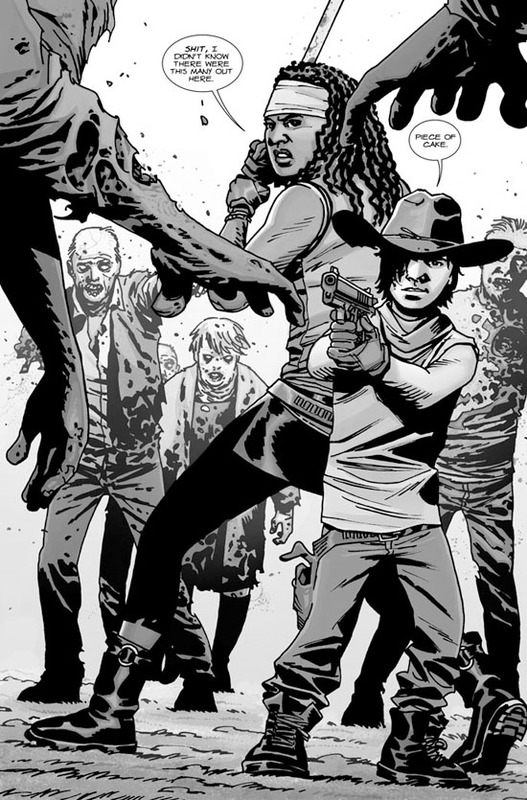 It’s great to see the bond that has developed between Michonne and Carl. There is also another great scene with Michonne and Andrea where they discuss how much their lives have changed while they enjoy a quiet lunch together. Andrea points out how they always used to be on edge, ready for the Walkers to attack at any time, and how the relative safety of living in Alexandria makes it possible to enjoy the simple pleasure of having lunch with a friend again. Sadly the Zombie Apocalypse has brutalized Michonne so much that she doesn’t believe she has any social graces left. She reveals how she used to be a chatty and friendly person before the outbreak, and it’s heartbreaking to watch her admit that she doesn’t think she could ever be that person again. While a brief interlude between Spencer and Father Gabriel, where Spencer goes to solemnly pray at the altar for the strength to grant his request, may seem superfluous to the overall plot, it could nevertheless herald a significant development for the future. 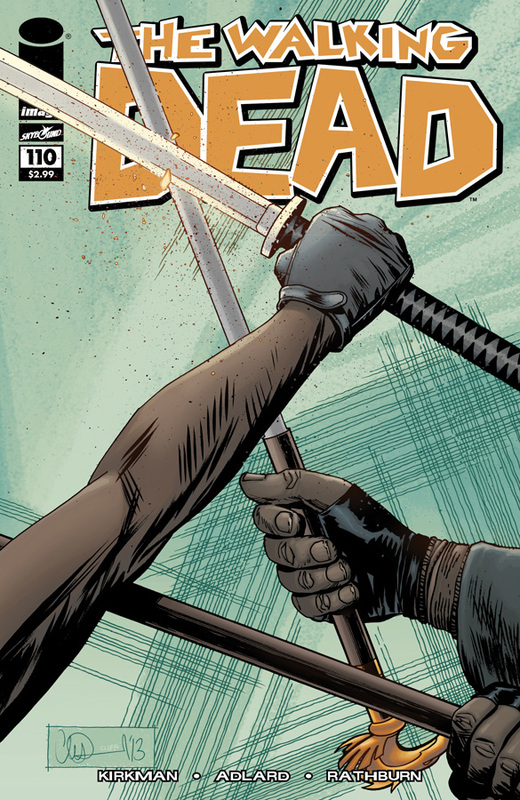 The Walking Dead #108 is another fine issue by Robert Kirckman and Charlie Adlard. The new alliance between Rick and Ezekiel offers a wealth of possibilities for the future, there is some superb character development for Michonne, and it looks like Rick will soon get the chance to take revenge against Negan and the Saviors for all the atrocities they’ve committed.